"Yay! Fantastic news, I can't believe I have won!" This was the reaction from Siyamamkela Matshisi of Promenade, Cape Town on discovering he had won a brand-new Polo Vivo car in a competition launched by AEG and Game. 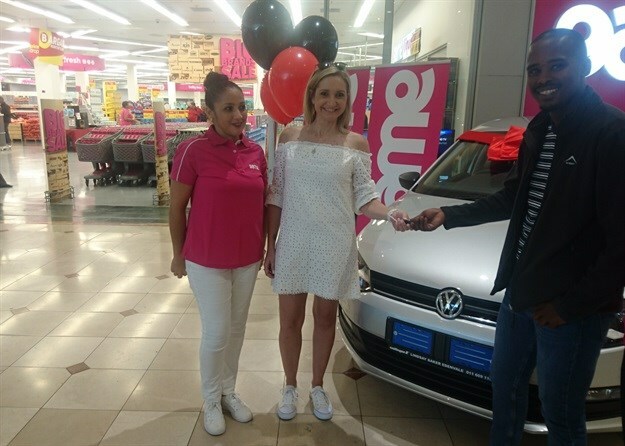 WINNING WHEELS: Siyamamkela Matshisi of Promenade in Cape Town (right) was delighted to win a brand new Polo Vivo in a competition hosted by AEG and Game recently. He is pictured here accepting the keys for his new wheels at the official prize handover at Game Canal Walk on Friday. With him are Lee-Ann Tomlinson of Game (left) and Michelle Morrick of AEG (centre). Customers who spent R3,999 or more on any AEG appliance at Game, between November and January, could enter into a draw to win one of 100 Game vouchers valued at R2,000 each, or the main prize – a Polo Vivo car valued at R200,000. The prize car was officially presented to a delighted Siyamamkela Matshisi at Game Canal Walk on Friday, 1 March. Handing over the keys, Game Canal Walk store manager Nizaam Dramat said he was so excited that the winner was from Cape Town, as the competition was a national one. "We wish Mr. Matshisi many safe miles of driving with his new wheels, and we hope that this prize opens many doors of opportunity for him." Michelle Morrick, Marketing Manager for AEG, said the competition had been a huge success and they were proud to have partnered with Game. "We had over 2,000 people entering. The selection of the voucher winners was done randomly, while the car winner was chosen by an accredited auditor. We are delighted to be able to share this excitement with Mr. Matshisi and wish him safe travelling and new adventures."